Thank you all for the very kind comments on Sunday’s post—as well as some of the emails and messages I’ve gotten since then. I’m a little at a loss for how to express my thankfulness or articulate how touched I am. Hopefully my appreciation is shining through the words I’ve got. In that post, I mentioned that food has been a big source of comfort through this breakup. In the first few days of being newly on my own I felt overwhelmed to think of how much I’d miss the rhythms of cooking for two and the satisfaction of sharing food. For the past three years I’ve taken a lot of daily pleasure in offering nourishment to another person, and now I feel the absence of that ritual keenly. I hope I’ll get to share my meals again someday. For now, though, I’m taking solace in the joys of cooking solo for the first time in a long while. Cooking has always held a lot of symbolic importance for me. 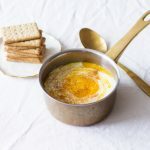 When I was recovering from anorexia, cooking was an act of resistance against the disease and my way of asserting the desire to be healthy again. It was rebellion against the restrictive impulse, a gesture of generosity toward myself and my body. It signaled the hard-won realization that I deserved to be fed, to be satisfied, to have my hungers met. During my post-bacc years, cooking came to symbolize my commitment to recovery. It would have been easy to use my unhappiness or shortage of free time back then as an excuse to start cutting corners with food, to use restriction as a means of managing the stress. But I didn’t. In spite of the long days and the fact that I was desperate to feel empowered in the face of my academic struggles, I protected my relationship with food. I cooked for myself whenever I could and sat down to three balanced meals every single day. In the past, I’d withheld food as a means of proving my own strength; this time, I got the strength I needed from eating. Now I’m turning to food once again, this time as a source of comfort. Mealtimes remind me that small, daily rituals can be powerful anchors during times of change and loss. Cooking is my way of being kind to myself, of taking care of my body in spite of the fact that my heart is aching. To make a pot of soup or bake bread doesn’t sound like much, but right now, it feels like a lot. It feels like everything. So here’s the kind of meal I’ve been having a lot lately: a hearty legume soup to pair with toast or rice or whatever you like. 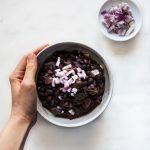 I’ve always loved black bean soup, but I’ve never created a formal recipe to share on the blog. 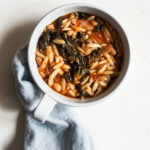 This particular one gets some heat from seasoned chipotle peppers, and I throw a whole bunch of kale in at the end, giving the meal a little extra nutrient density. It’s filling, warming, and easy to make—which is exactly what I need right now. Heat the oil in a large stock pot over medium heat. Add the onion and carrot. Cook for 5-7 minutes, stirring frequently, or until the onion is tender and clear. Add the garlic and chipotle peppers in adobo; cook for another 2 minutes, stirring constantly. Add the cumin, coriander, beans, broth, water, and salt. Bring the mixture to a boil and reduce to a simmer. Cover the soup and simmer for 60-90 minutes, or until the beans are tender. If you like, you can puree the soup partially with an immersion blender or by transferring a few cups to a standing blender (it's also fine to lave the soup as it is). 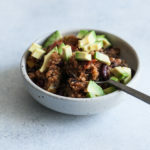 Stir in the vinegar and adjust the salt to taste; you can also add a touch of extra heat by stirring in a little more chopped chipotle pepper. Finally, stir the kale into the soup, re-cover, and allow the kale to cook for about 5 minutes, till it's tender. Serve the soup with any toppings you like. Leftover soup will keep for up to 5 days in an airtight container in the fridge. Soup can be frozen for up to 2 months. I haven’t tried it yet, but I’m guessing that the soup would be especially good with some cashew cream stirred in (a vegan spin on sour cream), or some coconut bacon on top. 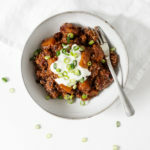 You could also easily adapt it for a slow cooker; just throw the ingredients in and let it simmer at low heat overnight. That bread you see back there is the peasant bread from Alexandra Stafford’s wonderful new book, Bread Toast Crumbs, which I’ll be sharing from next week. It’s the first homemade bread I’ve ever mastered consistently—which hasn’t been hard, given how utterly simple and foolproof the recipe is. Bread, just like soup, is quintessential comfort food, but it has the added bonus of conferring the pride that comes with a good baking project. The book found me at the right time, and I’m excited to tell you more (and perhaps share a toast recipe that all these homemade loaves have inspired). For now, I wish you a great start to the weekend. you are being very brave right now. I know how hard it is to struggle with an eating disorder as well as cooking for one. how do you find the ability to handle those voices? when I’m under stress as I am right now I have found I simply can’t. and there is no joy in cooking for one as it just makes it worse for me. oh I do admire your ability to continue to wrestle with those demons. you should be proud of yourself. please do continue your cooking and find joy and comfort in it. any chance you will start to prepare some small sized recipes for those of us who are also cooking for few or even alone?? ?